The calm at the end of the day. A pause. A moment. A stillness. When we can listen…and hear. Hear beyond all the worries that fill us – the schedule, the deadlines, the mis-steps, the next steps, the fears, the uncertainties, the unknowns. All the things that can take up all the space in our minds, in our hearts, and stop us. From really listening and really hearing what’s happening in the moment. The child quietly playing, the birds chatting as the sun goes down in the garden, the hum of traffic in the distance, a question tapping at our hearts. All the things we can’t hear when our heads are swimming with the busy stuff, the fearful stuff. A pause. Sometimes that’s all it takes. To stop, and pause. To breathe and pause. And, to listen, in the moment. It’s there that we can find a quiet stillness – a calm, at the end of the day. The image: This photograph was taken in a vacant lot in downtown Toronto, during a pause in an errand-running day, when the yellow brick wall and red brick lines caught my eye. It wasn’t until I walked into the lot, and had taken a number of photographs that I even noticed the tree, way over at the edge of the lot. 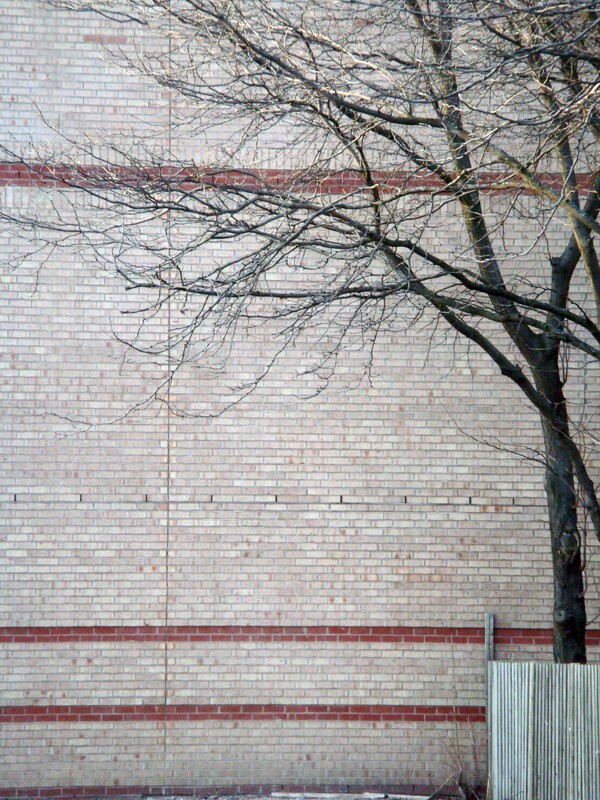 And, that winter tree, with its dark and wild branches, set against the certainty and linearity of that yellow and red brick, man-made wall, that’s what really gave me pause, and provided a moment…a moment of beauty, in a vacant lot. Juli – now that I am retired and no longer have daily job stress and my children are grown and on their own, you would think that my mind would be free of those worry distractions. But no, my mind is still busy with “stuff” – being in the moment, taking a pause, is something I have to continually work at. Aren’t we lucky that photography offers us a way to slow down and find beauty where it is so unexpected? Love the contrast of the organic tree against the orderly pattern of the bricks. Juli, I really like your choice of an image to go along with this post. The contrasts in the photo and lots of “open” space in the image seem to work so well with your writing. I too enjoy the pause that photography provides in my world. We are blessed to have this creative outlet. I love this thought process. It is the same exact one I’ve been actively working to bring into my every day life….and in the midst of all the chaos of every day life, I’ve found I’m much happier for pausing to notice the little things. thank you for your lovely comment on the design. 🙂 I love your new header, it’s so colourful and artistic. I tried to send you an email but I couldn’t find an address anywhere. Another beautiful moment of reflection and pause in the day. Terrific!